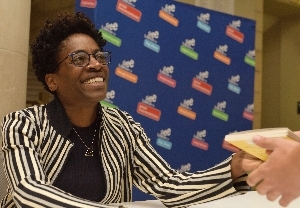 Wed, January 17, 2018 7:30 P.M.
Join featured author Jacqueline Woodson for an evening of conversation, reading, and performance. In conversation with WHYY's Katie Colaneri, Ms. Woodson will discuss identity, shifting cultural landscapes, and other themes in her writing. The event will conclude with a performance inspired by Another Brooklyn from 2016-17 Philadelphia Poet Laureate Yolanda Wisher with members of her band, The Afroeaters. Book signing to follow.